This book randomly crossed my mind the other day. Aside from my brother's He-Man and GI Joe collections I would always raid his books. CYOA or choose your adventure was definitely one of the titles I would gravitate to. 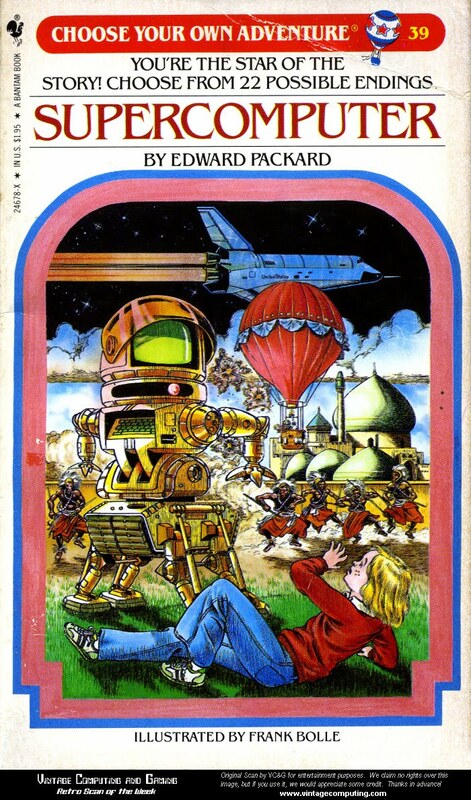 Something about the title just made me very excited ( I also loved the crazy hand drawn covers- notice the spaceship, hot air balloon and tribesmen behind the bronze robot...yeah coz that is exactly what everyone thinks of when you say supercomputer ). Also, as a kid you really don't get to choose anything so I guess that was the big time appeal. Honestly though, I never did get to finish any of the books. I would always get impatient and instead of enjoying the story I was busy trying to get to the next part or at least guess what it would be. I, also, cheated *gasp*. Meaning, I would look at both choices and try to manipulate my page turns so I could only read the awesome ones. So it got very frustrating. I actually ended up unsuccessfully finishing any of the books for fear of getting disappointed. Looking back, however, I think one of the things that made me lose interest is the realization that no matter what, you really don't get to choose your own adventure...more like you only get to choose an adventure that has already been preselected for you.